Preventative maintenance and emergency ac repairs are facts of life in Orlando, FL. We have been fixing, replacing and installing air conditioning units in Central Florida for over 25 years. We have experience, knowledge and professionalism unmatched by our competitors. Our huge warehouse facing I-4 near Downtown Orlando can help make your repairs a same day affair. If you need a part we usually already have it stocked and ready for you. Call us today for all your air conditioning company needs. Your home air conditioning system is the single most expensive appliance in your home. When it stops working the first reaction is to panic. Don't panic. Call us today and let us help you. We have over 25 years of in-home experience troubleshooting, diagnosing and repairing air conditioning issues. Whether you live in Orlando, Cocoa or Port St Lucie. 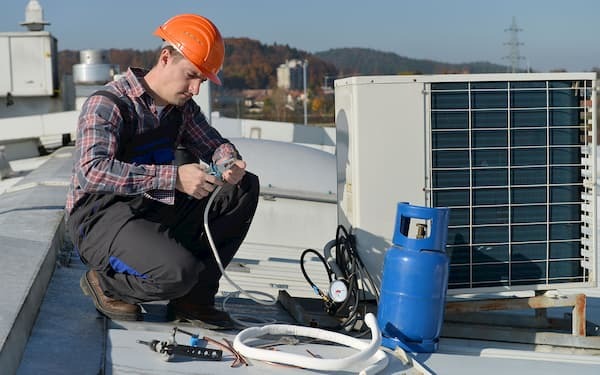 Our certified ac repair technicians are standing by to diagnosis and repair your hvac system. Sometimes ductwork can sag or fault. This problem can create dead zones for cooling and heating in your home. Our ductwork experts can find the proper solution to your issues. Faulty lights, tripped breakers? Shaky plugs and lopsided ceiling fans? Our expert certified electricians can repair everything from the plug to the generator. If it is electric we got you covered. We can get you properly sized with the perfect SEER for your home usually same day. Our ac install teams work all day and with our warehouse stock air conditioning installs are usually same day as well. We leverage the best air conditioning technicians, electricians and plumbers in Central Florida to bring you cost savings. Our technicians can give you a full evaluation of your home form the air conditioning system to the water heater. Knowledge is power. Your air conditioning system doesn't get a break. We don't take breaks either. You will always reach a trained dispatcher when you call us, not a call center. Our on-call service technicians will come rain or shine, day or night. Call us for emergency service today. About Promag Energy Group A/C & Heating, Inc.
Promag Energy Group is a family owned and operated business located in Florida. We have several offices located throughout the state including Cocoa, Ocala and Fort Pierce, FL. We provide air conditioning and electrical service throughout the State of Florida. We were started in 1988 by the owner James D Harris. Recently he was joined by his son John G Harris. The Harris family is involved in all aspects of the business. From dispatching to loading trucks the father & son team can always be found working. Promag Energy Group has a long tradition of HVACR work and experience. We are partners with ACCA and the BBB. We also maintain a relationship with all major air conditioning manufacturers and suppliers located throughout the State of Florida. In 2014 we purchased our corporate headquarters which directly faces I-4 near downtown Orlando. We hope to always maintain our dedication to excellence, family values and hard work as our team of technicians helps keep you and your family comfortable yearlong. The least known aspect of any homeowner's life is the quality of their home's air. If you haven't thought about your home's air quality recently don't worry we got the answer. Every month we send out home projects you can do yourself to enhance your home's air quality and comfort levels. The Air Quality Tips and Tricks newsletter is not intended to replace a qualified air conditioning technician or electrician. Always follow proper safety guidelines and never do work intended for a certified licensed professional.